BackRex Internet Explorer Backup is a backup and restore tool for Internet Explorer. It allows you to save your current configuration of Internet Explorer including favorites, history, proxy settings, fonts, dialup accounts, autocomplete passwords and cookies BackRex Internet Explorer Backup can help you to migrate or transfer Internet Explorer settings from one computer to another, even with different version of Windows and/or Internet Explorer (for example from Internet Explorer 7.0 to Internet Explorer 8.0 or vice versa). How does it work? 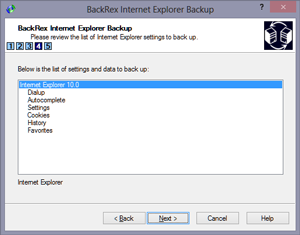 Install and run BackRex Internet Explorer Backup on a computer, which Internet Explorer settings you want to save, then choose Backup option in program, and finally choose a folder to save all data in. When BackRex finishes, keep results in a safe place - you'll need them to restore your Internet Explorer settings. To restore, run BackRex Internet Explorer Backup from the folder, you have saved Internet Explorer settings in, and in a few minutes all your personal information will be restored. BrowsingHistoryView is a utility that reads the history data of 4 different Web browsers (Internet Explorer, Mozilla Firefox, Google Chrome, and Safari) and displays the browsing history of all these Web browsers in one table. AskSoft Combine - the first high-grade, multipurpose program for automation of actions in services of anonymous questions. A chrome extension to change google search result unordered list to ordered list. It will be convenient and effective to search and make SEO if number figures can be added before each line of searched results when we use Google search in Chrome. This site does not contain serial number, crack, keygen BackRex Internet Explorer Backup serial number : serial number is the simplest type of crack. A serial number(cdkey,product key,etc) is register the program as you may already know. a crack or keygen may contain harmful software. If you cannot find the exact version you want, just give it a try. for more information read .nfo/.txt/.diz file include in zipped file.